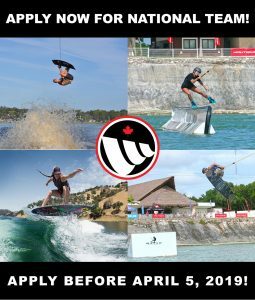 Wake Canada invites all interested Canadian wake boat, wake park and wakesurf riders to apply for selection to Wake Canada’s 2019-20 Canadian National “Development Team” and “Senior Team”. Please see the separate Selection Criteria below for “Development Team” and “Senior Team”, respectively. Please use the appropriate application documents below and submit by April 5, 2019 to be considered. The “Development Team” program supports Canada’s top up-coming riders age 18 & Under. Riders younger than age 14 will be considered if exceptional competition results. The “Senior Team” program supports Canada’s highest level riders. Riders 18 & Under with elite level competition results, may also apply for “Senior Team” consideration. The number of positions for each of Senior Team and Development Team will be dependent on quality of applications and available team program funding. Application deadline April 5, 2019. French language applications are available upon request. The Wake Canada 2018 Canadian Wakeboard Boat Nationals presented by Nautique Boats & Pride Marine Group AND Straightline Wake Park Nationals presented by Rip Curl at Ranch Wake Park / Spray Lake, Ontario. Supported by SBC Wake Magazine and Ontario Wake and Ontario Ministry of Tourism, Culture and Sport as part of the Wakeboard & Water Ski National Championships Festival. Featuring Canada’s top pro and am boat and park riders! Re-cap video filming and edit by Drew Austin. Thank-you to Scott & Jono Boysen, Erika Langman, Leslie Sparks, Vince Whiteman, Steve Jarrett, Todd & Rebecca Spalding, Shelly Zellenrath, Mike Case and all of the volunteers who helped organize such an amazing event! The Wake Canada 2018 Canadian Wake Park National Championship presented by Rip Curl at Pointes Wake Park, Beachclub, Quebec. Supported by SBC Wake Magazine and Liquid Force. Featuring Canada’s top pro and am park riders! Re-cap video edit by Jeremie Jeannotte. Filming: Jeremie Jeannotte and Steve Jarrett. Thank-you to Alex Savoie, Erika Langman, Jan Tibo, Pete Besner, Vince Whitman, Steve Jarrett and all of the volunteers who helped organize such an awesome event! 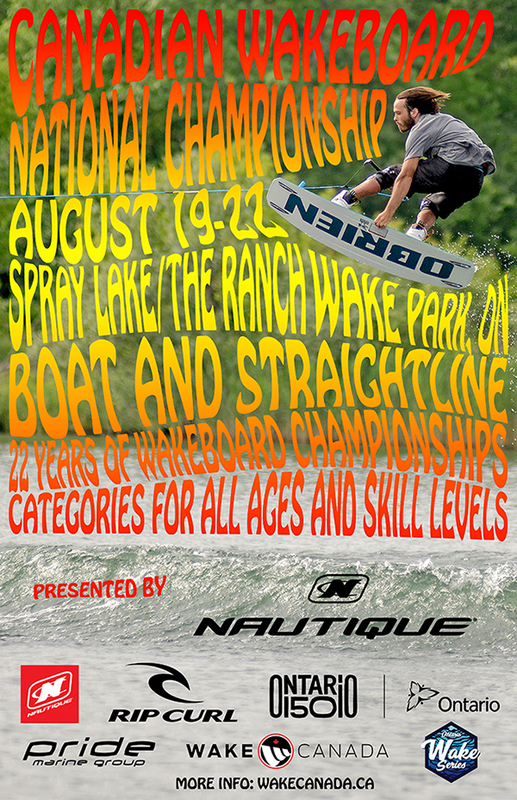 Canadian Wakeboard Boat Championship presented by Nautique Boats and Pride Marine Group and Straightline Wakeboard Championship presented by Rip Curl and Ontario Wake will be returning to Spray Lake/Ranch Wake Park, Newmarket, Ontario for 2018! Supported by Ontario Ministry of Tourism, Culture & Sport as part of the Wakeboard & Water Ski National Championships Festival! Click here for Boat Nationals Online Registration! Click here for Straightline Nationals Online Registration! The Canadian Wake Park Championship presented by Rip Curl will be returning to Pointes Wake Park, Quebec for 2018! 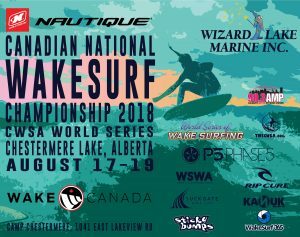 The Nautique Canadian Wakesurf Championship presented by Wizard Lake Marine will be returning to Camp Chestermere, Chestermere Lake, Alberta for 2018. 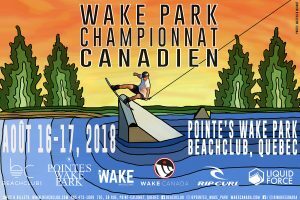 The 2018 Wake Canada National Championship Series kicks off with the first of four events on August 16-17 with the Wake Park Nationals presented by Rip Curl at Pointes Wake Park (full cable) in Quebec. 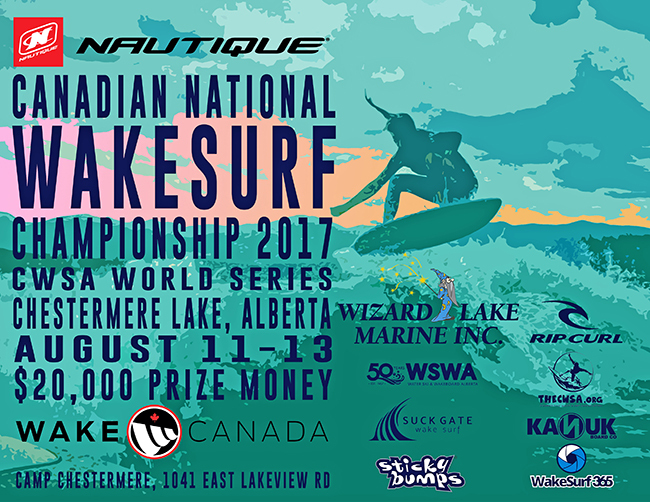 The Nautique Wakesurf Nationals presented by Wizard Lake Marine return to Chestermere Landing, Alberta on August 17-19. 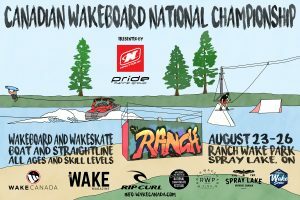 The Wakeboard Boat Nationals presented by Nautique and Pride Marine return to the Ranch Wake Park / Spray Lake in Ontario August 23-25 in conjunction with the Straightline Wake Park Nationals August 26. Both events are supported by Rip Curl, Ontario Wake and Ontario Ministry of Tourism, Culture & Sport as part of the Wakeboard & Water Ski National Championships Festival. More info and registration details dropping soon. Stay tuned to @WakeCanada instagram for updates. The Wake Canada “Wakeboard Boat” National Championship presented by Nautique, Pride Marine Group at The Ranch Wake Park, King Township, ON August 21-22, 2017 in conjunction with Rip Curl , “Ontario 150“, the Ontario Wake Series and SBC Wakeboard Magazine. Featuring over 80 of Canada’s top amateur and pro riders! Re-cap video filming by Blake Breton and editing by Max Trudel. Thank-you to all of the Wake Canada and Ontario Wake volunteers who helped organize this 22nd annual championship! For full results click here! The Wake Canada “Straightline” Wake Park National Championship presented by Rip Curl at The Ranch Wake Park, King Township, ON August 20, 2017 in conjunction with “Ontario 150“, the Ontario Wake Series, Nautique, Pride Marine Group and SBC Wakeboard Magazine. Featuring over 80 of Canada’s top amateur and pro riders! Re-cap video filming by Blake Breton and editing by Max Trudel. Thank-you to all of the Wake Canada and Ontario Wake volunteers who helped organize this outstanding event! For full results please click here! 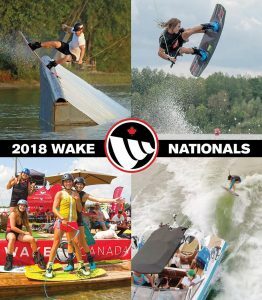 Wake Canada is pleased to announce that the 2018 Wake Development and Senior National Teams Selection Criteria and Applications are now available. Deadline to apply: NOVEMBER 15, 2017. Canada was well represented at the 2017 Centurion World Wakesurfing Championships presented by GM Marine in Kelowna, BC, Canadian wakesurfers garnered 14 podiums spread across amateur and pro categories, including seven world amateur titles! The World Championship, hosted in Canada for the first time, enjoyed participation from 120 of the best wakesurfers from around the globe! 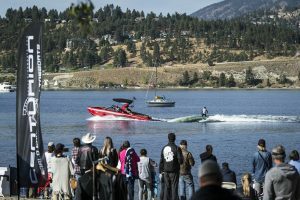 Canada is a growing wakesurf powerhouse similar to it’s international prowess in wakeboard, wakeskate and wake park competition! Canada’s Caroline Villeneuve finished 2nd in the Pro Women Wakesurf “Skim” category acheiving Canada’s top result, followed closely by fellow Canadian pros Brittney Nyrose in 3rd and Julie Vasselin in 4th. In the Pro Men’s Wakesurf “Skim” category, Canada’s Dom Legace finished 6th and was also honoured with the CWSA (Competitive Wakesurf Association) “Legend” Award. 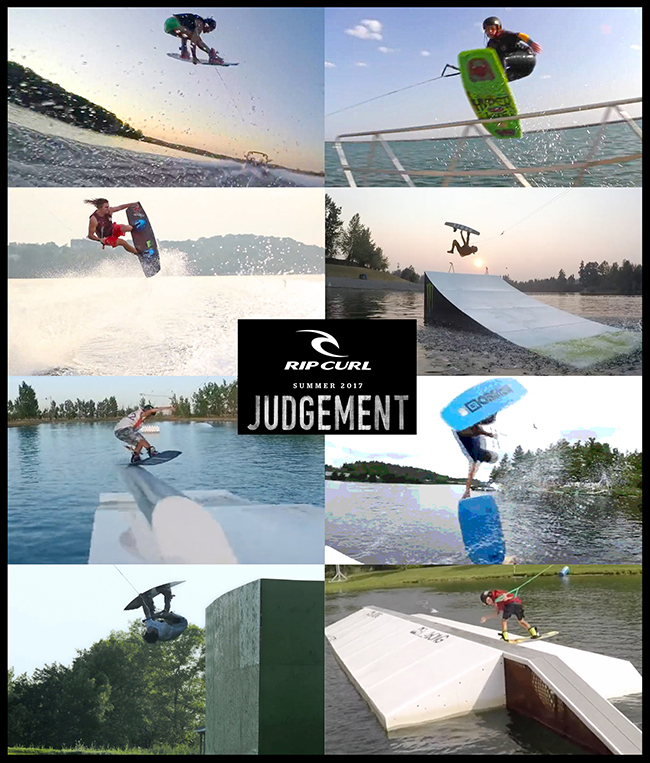 Click here to check out all of the videos now for Rip Curl’s The Judgement Video Battle on AllianceWake.com and vote for your fav! Presented by Wake Canada and Alliance Wake. Spray Lake, King Township: Wake Canada is excited to announce this year’s prize purse at the Canadian Wakeboard Boat & Straightline Championships presented by Nautique Boats and supported by Ontario 150, Pride Marine Group and Rip Curl . 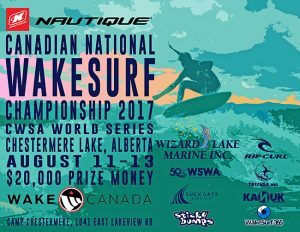 The event will take place over four days from August 19th – 22nd , 2017 at Spray Lake / The Ranch Wake Park in Newmarket, ON. Online Registration is posted HERE. Online registration will close Friday Aug 18th, 2017. Late Registration will take place Saturday & Sunday Aug 19th & 20th, $50 late fee will apply. Familiarization Wake Park: $10 sets on Saturday Aug 18th (will be wavy with boat running) . Official practice will take place Sunday morning. Also – Don’t miss the official premier party of the 2017 Rip Curl’s The Judgement Video Contest on Sunday August 20th at 6pm, following the Canadian Straightline Cable Championship. 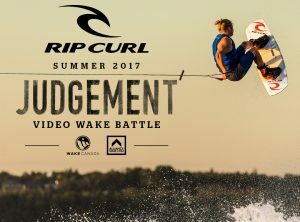 One Week to go before submissions are due for RipCurl’s The Judgement Video Wake Battle!Here are a few updates: All Videos are Due Monday Aug 14th 2017 at midnight! Please make sure all submissions are password protected Vimeo files available for download. All videos must have bumpers included. 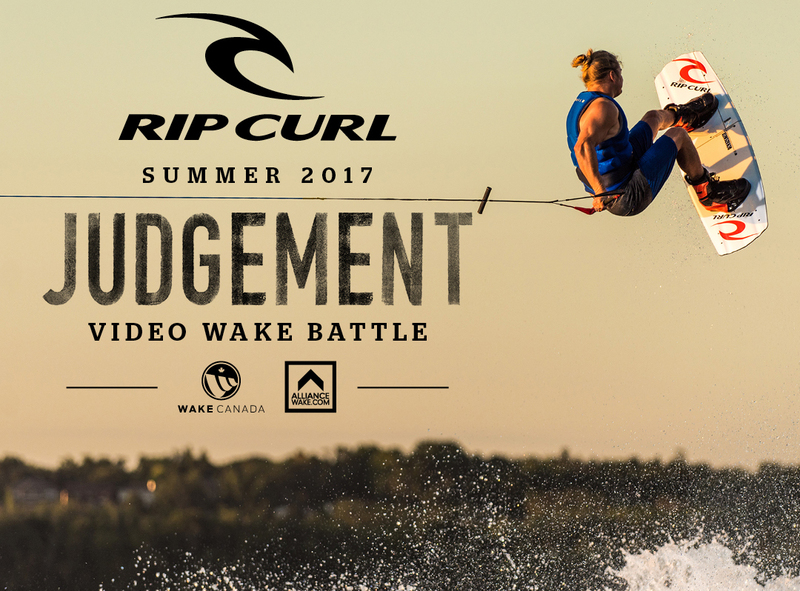 Wake Canada in partnership with RipCurl Canada and Alliance Wake is excited to announce the return of RipCurl’s The Judgement Video Wake Battle. This year the contest will be open to any individual rider, or crew of any size, and include all disciplines that encompass wake. Submissions: RipCurl’s The Judgment is open to any team or individual willing to participate, however the organizing team withholds the right to remove videos with explicit or inappropriate content (drug and alcohol use). A total of 10 videos will be selected for the contest by the judging panel. Please make sure all submissions are password protected Vimeo files available for download. All videos must have bumpers included in their files. Bumpers will be available for download in July. Music Selection: Royalty free music is encouraged for team edits but not mandatory. Explicit music is not permitted in the form of Strong language; Images of or references to violence, physical, or mental abuse. This will be the exposure round for the people’s choice vote. Exposure is measured in the total amount of votes for each video. Teams with the highest exposure will receive the people’s choice award. Wake Canada’s 2017 Canadian Wake Park Championship presented by Rip Curl brought together the country’s top up-and-coming riders and established pros to Pointes Wake Park the country’s premier wake park! Located at the Beach Club, north of Montreal, QC, Pointes Wake Park is home to several of Canada’s top park riders including Yan Tibo, Alex Savoie, Arnaud Derome and Nic Leduc. Alex Savoie took the lead as the host event organizer and Arnaud Derome as head judge working in conjunction with event director Erika Langman. Event photo galley and results below. The event will take place in Chestermere, Alberta, at Camp Chestermere . The water depth is 15-20 feet and water temperature will be 68-74. Chestermere is located 25 minutes from the Calgary International Airport. The host hotel is a Best Western Plus and is located less than 1 mile from the lake and walking distance to the host restaurant and bar on the lake. There are many other amenities nearby. See attached letters regarding room block rate. Camp Chestermere will be offering on-site camping for tents and RVs with cabins for rent. Event Description: The Camp is a 6.5 acre venue with a full kitchen serving breakfast, lunch and there will be food trucks on site. One evening there will be a banquet style dinner for competitors and guests. For a small fee, kids will be able to do camp activities like rock climbing, archery, canoeing, etc, with the camp councillors. The Canadian Wakeboard National Championship presented by Nautique boats will move from the Ontario Place West Channel in Toronto to Spray Lake / The Ranch Wake Park in Newmarket due to the continued record high water levels of Lake Ontario. The Championship will maintain the same dates of August 19-22. “While Lake Ontario water levels are now receding from this spring’s 100 year high, we felt the need to change venues to ensure optimal riding conditions, four weeks out from Nationals,” stated Sean Fleming, Chair of the Wake Canada Committee.